Congress was notified Thursday of the official certification of the international weapons deal, the Defense Security Cooperation Agency said in a statement. 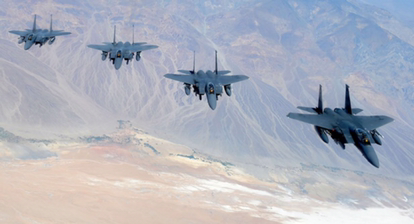 Aside from the F-15QA jets and an “associated weapons package,” the $21.1 billion deal also includes flight training in the continental US, ground support, “mission critical resources and maintenance support equipment,” weapons support and “test equipment spares,” as well as other logistical support and training programs. Top among the dozen contractors in on the deal is Boeing. Others include Astronautics Corporation of America, BAE Systems, Elbit Systems of America, General Electric Aviation, Honeywell Aerospace, Lockheed Martin, L3 Communications, NAVCOM, Raytheon, Rockwell Collins, Teledyne Electronic Safety Products and UTC Aerospace Systems. Two dozen US government representatives and 150 private contractor representatives will be assigned to implement the sale.